As trees outgrow their space, fall ill, become a maintenance issue or put people and property at risk it becomes necessary to remove them. However, removing trees results in a stump, a constant reminder of what was, and a general nuisance that takes up space. 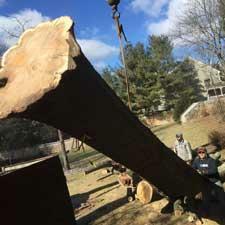 Woodpecker Tree Service provides expert stump removal in Wharton and the surrounding communities to help you remove unwanted eyesores and regain complete use of your land. Give us a call to request a free estimate. Using a high powered stump grinder we're able to level the stump with the ground, or lower, giving you complete access to your land. When we leave your property will be free and clean of any wood chips or other debris that is unwanted! Don't delay having that stump removed any longer. Removing it will make lawn mowing easier, reduce the chances of an insect infestation and allow you full access to your property! 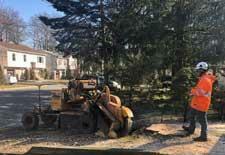 Woodpecker Tree Service is also experienced in the removal of shrubs and bushes. Whether for maintenance purposes, beautification or because of plant health issues, our team can help you accomplish your property goals. 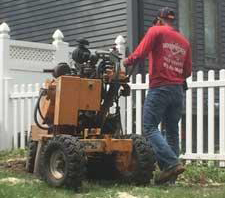 To request a free estimate for stump removal in Wharton or the neighboring New Jersey communities call Woodpecker Tree Service at (973) 607-2549. We look forward to working with you to enhance your property. "I have to say that Woodpecker Tree Service did an outstanding job on our property. They trimmed a tree by the driveway, trimmed our bushes, and trimmed a set of 3 pine trees and the top of our driveway. 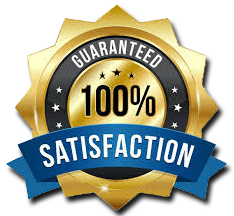 The owner was a very polite and honest guy and knows how to give excellent customer service." When Should I Remove a Tree From My Property?